I don't question the sincerity of the musicians of the Hillsong band. I don't questions their motives or their genuine experiences with God. I don't undermine the worship bands who play these songs or those who listen to them. I also don't question the sincerity of Muslims who pray to Mecca five times a day. I don't question the sincerity of the Orthadox Jews crying out to their God at the Wailing Wall in Jerusalem. Sincerity is not the issue. Living according to the principles of the Word of God is the issue. "Sincerety is not truth. You cannot put the seed of God in the Egyptian human and produce something good. Put the seed of God in a pure and godly womb and you'll produce the fruits of the Spirit," (Holcolm Brothers, Strange Fire Seminar 2002). Is it fair that I compare the modern worship music movement to false religions such as Islam? Well, I believe that this movement is a false religion, based on emotion, and I will explain why. Only that which is birthed out of the Word of God will remain forever. The concept of a Christian band is something I question. The musicians may be sincere, their experiences with God real, but is it Biblical? Is it trying to mix the ways of the world with the things of God? Only that which is based in the Word of God will last. "The grass withers, the flower fades: but the Word of our God shall stand for ever," (Isaiah 40:8). It is the Word of God is what changes hearts. It is the Word of God that sets the captive free. It is the Word of God that draws us closer to Him. The problem with modern day worship is it focuses on our experience, not the God of our experience. Over the past few decades the music we sing has strayed so far away from Scripture that we don't even realize it. It focuses on us, not God. The Bible says that the angels cry, "Holy, holy, holy is the Lord almighty," (Isaiah 6:3). This is a from of worship. Glorifying God. The problem with modern day worship music is that it does not repeat words glorifying God as much as it is repeating words to try to convince ourselves of something. The focus is on "I' or "me." Did you know that repetetion of words in a crowd is a hypnosis technique. This is not a joke. I do not say this lightly. It is real and powerful. Hitler was probably the most effective in using this technique because he understood its power. He uses the very same words again and again in his speeches. Consider why he repeatedly says “Jew, Jew, Jew”. Hitler had learnt that repeating a word three times had an identifiable effect on the crowd. Include and repeat, “blame, blame, blame” and you have mass hypnosis being used for evil purposes." (Hynposis Black Secrets). Do I think that our worship leaders or that the song writers of modern music want to hypnotize us? No. I believe that it is satan. He is gaining control of our songs and leading us away from the Word of God, and we are letting him. I am not comparing our worship teams to Hitler, but Hitler rather to satan. Think about it. If satan can influence the crowds to sing unscriptural words over and over again once or twice a week then it will become stuck in our heads the rest of their week. Rather than dwelling on Scripture, Christians are going around thinking in their head or singing aloud words that have no authority or power as the Word of God does. "Spirit lead me where my trust is without borders." (Hillsong quote). This is a prayer. Pray this in your prayer closet and see God move. This is not a worship song. It is not a praise song. It is a prayer. I get it. I may pray like this myself, at home, in my prayer closet, between me and God. But this doesn't not fit within the definition of worshiping or praising God. Satan wants Christians singing this over and over rather than getting the mind of Christ through the Word of God, the only thing that holds complete power on this earth today. I appreciate my pastor's sermon this past week when he said that when we are depressed, sad, or down we need to get in the Word of God. That message was water to my soul. Why? Because the Word will change you. Too many Christians suggest, "playing worship music," when you are sad and depressed. The problem with that is, most of the music labeled worship has nothing to do with the Word. It does nothing. If it does do something, it is simply based on emotion and an hour later, nothing is different and the Christian is confused as to why things aren't changing in their life. Then they turn to depression medication, or other things. The Word of God will change you, modern worship music does not. 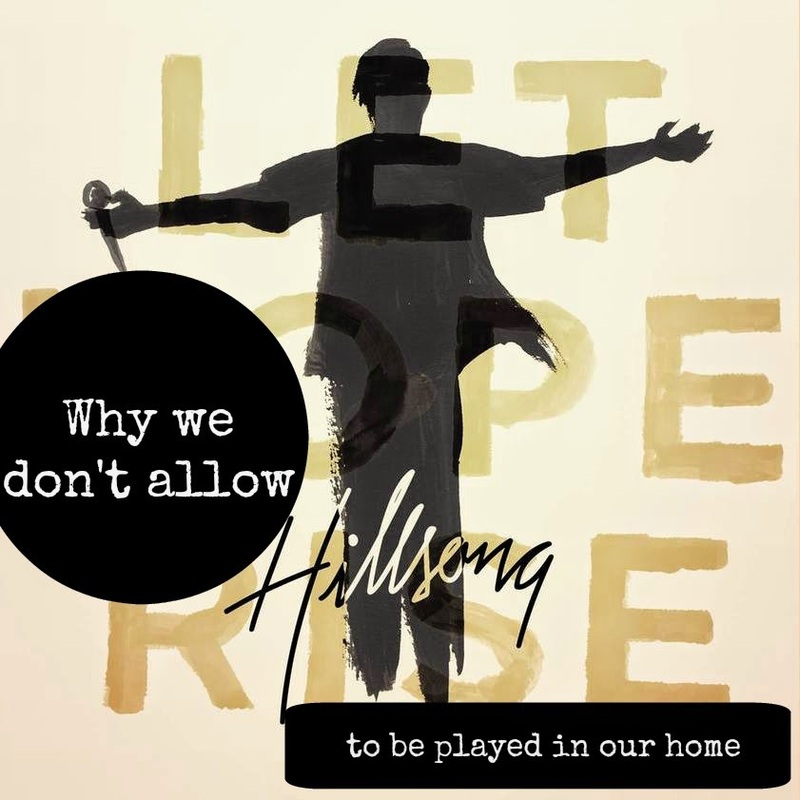 Just as Oprah is not allowed to be watched in my home because it draws on the emotion of the crowd through a false religion, modern Christian bands that with light shows and rock music such as Hillsong and Bethel are not allowed to be played in my home. This is my personal conviction. Your convictions may be different. What I am speaking about is in my home. If it is played other places, I'll listen but I won't sing. I can't sing. Because my convictions have been the same about Christian rock music for over ten years. God does not change with the times and neither will I. I am as fervent now about not allowing the world to creep into Christian music now as I was then. Please join me as we teach our children songs from the Word of God. The words of power, life and freedom! This article is so helpful for me in my life right now. Ive been Striving for clarity on music we play in our home and the church. this article was clear and based on the Word. Thanks be to To God ! Also what about playing certain songs from these bands that have Biblical lyrics, like shout to the Lord by Hillsong ? And do you have any specific bands,artists that you listen to? Thanks for asking! Although the former Hillsong songs written by Darlene Zschech aren't as aggressively post-modern as the current Hillsong United music, I think that just because a song may have decent lyrics we have to be careful of the modern music industry and how it makes money from these songs. The real question I've been dealing with, is do we really need other people's music playing in the background of our lives? When worshiping God is it really coming from our heart when others wrote the lyrics, and most of the time are making money from it? it's sobering and scary, and causes much soul searching. I have been slowly phasing out listening to music and just sing around the house with my kids songs based on Scripture either with the guitar or not.